BANGKOK - Hoping for a lenient sentence, a shackled U.S. citizen pleaded guilty Monday to charges of defaming Thailand's royal family, a grave crime in this Southeast Asian kingdom punishable by up to 15 years in jail. Thai-born American Joe Gordon has been detained since late May for translating excerpts of a locally banned biography of King Bhumibol Adulyadej and posting them online. Gordon committed the alleged crimes years ago while living in the U.S. state of Colorado, where he worked as a car salesman. The case has raised concerns about the reach of Thai law and how it is applied to both Thai nationals and foreign visitors. Lese majeste is the crime of insulting a ruler, and Thailand has the most severe lese majeste laws in the world. Critics say they have been increasingly abused by political rivals to harass opponents, particularly since a 2006 military coup. "I'm not fighting in the case. I'm pleading guilty, sirs," Gordon told three judges at a Bangkok criminal court. The 55-year-old spoke while standing with handcuffs and ankle shackles. Judges said that a verdict and sentence would be issued in the case Nov. 9. Defense lawyer Arnon Nampa told The Associated Press earlier that Gordon had decided last week to plead guilty after being denied bail eight times. "The fact that his bail requests have been repeatedly denied  that disheartened him and made him want to plead guilty," Arnon said before Monday's hearing. "He said he wanted the penalty to be lessened and intended to ask for the royal pardon." Royal pardons are granted to prisoners by the Thai king on special occasions, such as his birthday or the anniversary of his ascension to the throne. 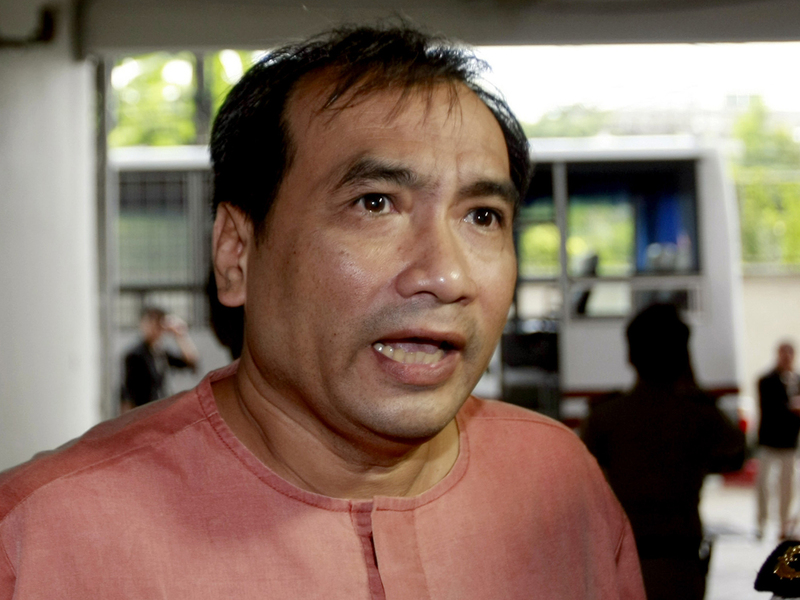 Gordon has previously denied the charges against him, according to the independent Thai-language prachatai.com news website, which has interviewed him in prison. Speaking briefly to reporters as he was being escorted into the courtroom, Gordon said pleading innocent was futile. "How can I fight?" he said, adding that the justice system in Thailand is "not fair." "I want the American government to help me because this is about freedom of expression," he said. American diplomats have pressed Thai authorities unsuccessfully to drop the case, arguing in part that it could damage the country's tourism image and deter some from visiting. American officials were present at Monday's hearing, U.S. Embassy spokesman Walter M. Braunohler said. "We will also continue to raise his case with Thai authorities, stressing at every possible opportunity his rights as an American citizen," Braunohler said. "We urge Thai authorities to ensure freedom of expression is respected." Many had hoped that the nascent administration of Prime Minister Yingluck Shinawatra, some of whose top supporters have been accused of lese majeste, would re-examine such harsh sentences for cases involving the monarchy. The issue remains highly sensitive, however, and Yingluck's government has been just as aggressive in pursing the cases as its predecessors. Gordon reportedly lived in the U.S. for about 30 years before returning to Thailand last March for medical treatment. Arnon said Gordon wished to return to Colorado. Gordon was arrested by Thai authorities in May in the northeastern province of Nakhon Ratchasima. His primary crime appears to have been that he translated excerpts from unauthorized biography "The King Never Smiles" into the Thai language and published them on a blog. He also provided links to the translation to other two web forums, prosecutors say. The book is banned in Thailand. In it, author Paul M. Handley retraces the king's life, alleging that Bhumibol has been a major stumbling block to the progress of democracy in Thailand as he consolidated royal power over his long reign.